Dreaming of owning acreage in beautiful Darmstadt? Look no further! This gorgeous 4 bedroom, 3 full bath home is located on 5.35 acres with lake frontage, an in ground pool and pole barn. 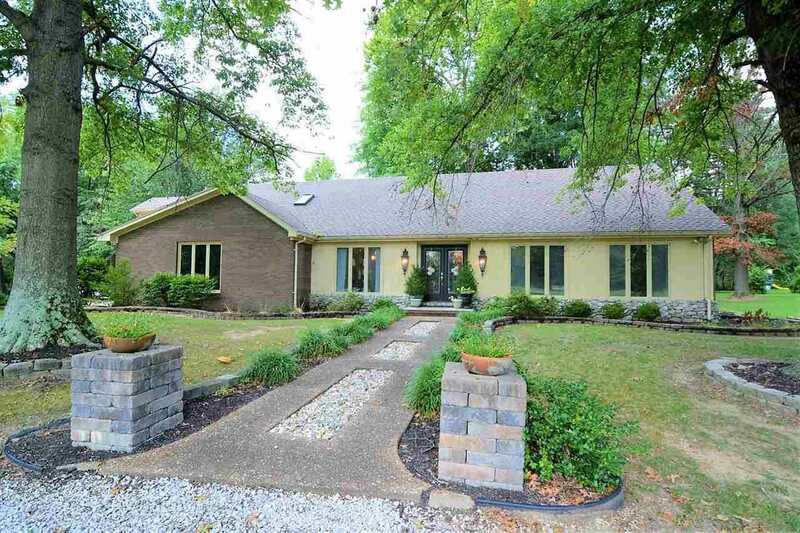 With over 4,000 square feet of living space spread out over 1.5 stories this home has it all! The large foyer welcomes you into a spacious family room with a vaulted beamed ceiling. Continuing the flow of a fabulous floor plan ideal for entertaining the great room offers a stone wall fireplace perfect for warming up in the winter months, a formal dining room with a beamed ceiling and a dream kitchen! The updated kitchen is offers a beautiful and long island with a serving bar, dual dishwashers, cooktops and ovens, a custom exhaust hood, a warming drawer, ice machine and a pantry. Enjoy your meals in the kitchen in the dining area with views of the in ground pool and backyard. The main level rec room offers a bar area, stone fireplace and is perfect for hosting a game night. Rounding out the main level, is a mudroom that leads to a full bath with pool access. On the second level you will find, a spacious master suite including crown molding, an updated master bath with whirlpool tub and a custom tiled walk-in shower. Three more bedrooms and a full bath with a double sink vanity and bathtub/shower combo. Laundry is located on the second level and an additional washer/dryer hook up is located on the main level near the pool. The second level also has an office with doors leading out to a small deck. Spend your days fishing in the lake, relaxing by the gorgeous in ground pool with a large patio space, fire pit area and top of the line landscaping. The large pole barn will house all of your toys and offers plenty of room for storage. This home is located in a private setting on Evansville's Northwest side but is conveniently located close to your everyday amenities. Schedule your showing today! Directions:Head North on Saint Joseph Road, turn East on Fleener Road. The driveway will be located north of the home. SchoolsClick map icons below to view information for schools near 1918 Fleener Road Evansville, IN 47725. Very helpful and professional team! I recommend them to anyone I know in the market!